Presentations combine the best of PowerPoint, Prezi, and Kumu into one easy-to-use tool. Combine text, video, images and maps into a single, engaging presentation that anyone can access via URL. Presentations can be accessed through the main menu of your project. When you create a new presentation, you&apos;ll land on a title slide, to which you can add a title, subtitle, and background image. A map slide is any combination of a map and a view. You can choose to have the slide zoom fit by checking the corresponding box, or you can create just the zoom you&apos;d like but zooming in or out. On a map slide, you can use the dropdown menus above the slide to choose which map and view will be applied. You can pick any map or view in your project. You can also activate focus or filter for a given map slide, and Kumu will remember those settings. This is a great way to unfold a map step-by-step for your readers. Text slides can include both a title and content. The content section supports markdown so you can also include images and other basic formatting (widgets aren&apos;t supported though). Images slides are just like they sound. Include an image URL and we&apos;ll present it in full screen glory. You can also choose to include a title. Embed slides are for interactive web content and support embeds from over 300 different providers. Just add the URL of the content you&apos;d like to embed. 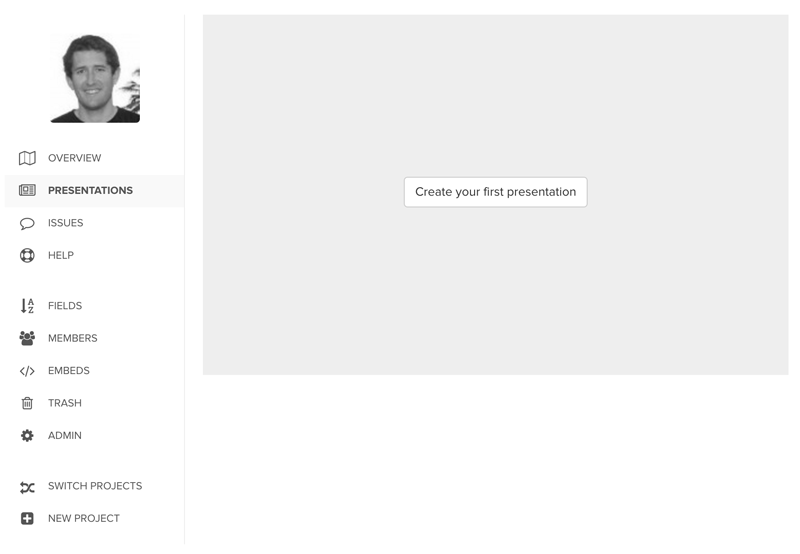 Once you&apos;re finished creating your presentation, click save and then exit the presentation builder. Click "publish" to publish the presentation and choose whether you&apos;d like to make the presentation public (unless your project is public in which case your presentation is automatically public) or if you&apos;d like to make it even more secure by adding a password. 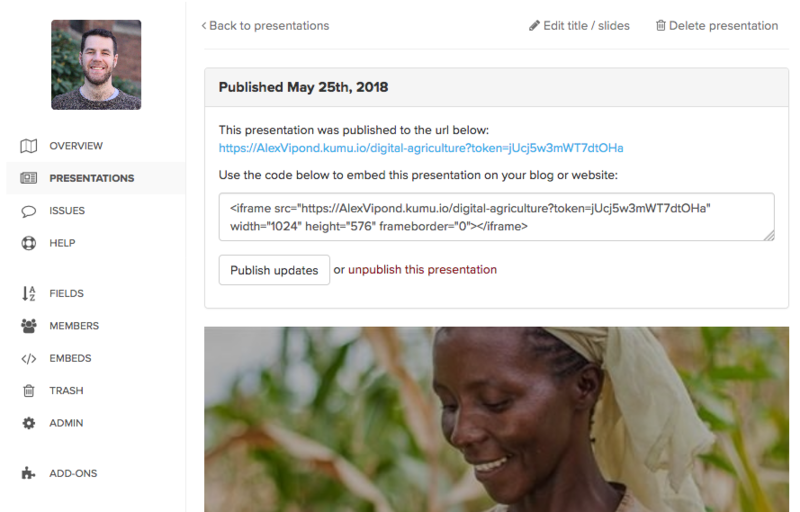 After you publish, Kumu will give you a link that you and your audience can use to view your presentation. Want to skip your title slide when you view the presentation? Just add /embed to the end of the presentation&apos;s link (only supported for public presentations, not private ones). Copy/paste the code onto your website, and you&apos;re visitors will see a fully interactive Kumu presentation! The first piece of this URL, yourusername.kumu.io/your-presentation is the default URL Kumu creates when you publish your presentation. To autoplay, just add ?autoplay= and the number of seconds you want to wait between each slide. In the example above, ?autoplay=10 tells Kumu to wait ten seconds, then advance to the next slide. When you have autoplay enabled on a presentation, Kumu will automatically loop around to the first slide after it reaches the end of the presentation.